Which is more difficult: achieving world peace or making a 1-ton book about world peace? Teacher Betsy Sawyer and her Bookmakers and Dreamers Club at Groton-Dunstable Regional Middle School are tackling that question, sort of. While they meet on Mondays after school to discuss peace, they are also attempting to break the Guinness record for the biggest book in the world. The strategy the club initiated four years ago to compile material for the massive tome - soliciting letters from local and world figures on the subject of peace - has been more successful than they expected. So far, they have received about 700 letters from such luminaries as the Dalai Lama, Nelson Mandela, and Jimmy Carter, Sawyer said. At present, the biggest book in the world is a 10-foot-high by 9-foot-wide, 300-page, 557-pound text in Denver, Guinness officials say. 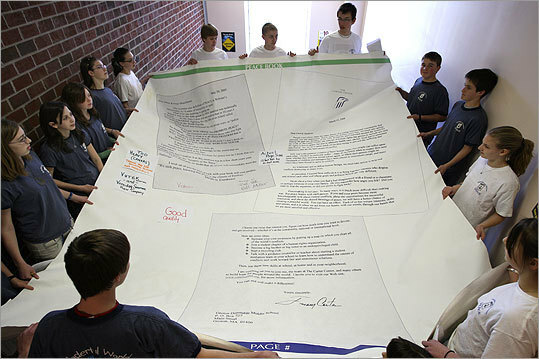 The middle school club's book, "Pages for Peace," would be 12 feet by 10 feet, said Sawyer. But, as in most big projects, unforeseen challenges have popped up. The club estimates it will cost $500,000 to print the book, for example. And then there are the laws of physics. You can't construct and store a 120-square-foot book just anywhere, after all. Projections put the weight of the book's cover, binding, and 500 double-sided pages, including the ink, at 2,000 pounds, Sawyer said. The engineering challenges those dimensions present have familiarized Sawyer and her students with issues they didn't consider when they set out to break the record. Some of those issues are so complex, the students need engineers to help them. "Depending on the density of the sheet and the area of the paper, you can work out how much the book will weigh not counting the weight of the ink and the binding," said John Ting, a Groton resident and dean of the College of Engineering at the University of Massachusetts at Lowell. Normal paper will not work for such large pages, for example, said Sawyer. Yet canvas pages would increase the weight of the book dramatically. Vinyl used for large signs and posters, such as those on billboards, is also too heavy. Light plastic is too thin and transparent. Recently, DuPont agreed to donate its Tyvek brand paper for the project, Sawyer said. That's the paper with fabric-like qualities that home builders wrap around a house before putting up shingles or siding. Vutek, a Meredith, N.H.-based printer, has agreed to donate time to make the book on the company's large-format printers. Vutek thinks the DuPont paper will be sturdy and light enough, Sawyer said. Help from those two companies leaves the club with one last hurdle. After Ting and a cadre of UMass students started helping the club in 2005, they quickly isolated a problem nonengineers might not have considered: How does one turn a 10-foot-wide page? Working through a university program that combines coursework and community service, the students have been developing a page-turning mechanism that will allow readers to flip through the book's massive leaves. The first device the students created used magnetic ink and a long, hydraulic metal arm to turn pages, but that proved too heavy and unwieldy, Ting said. Now they have developed a system that uses a puff of air to lift a single page, allowing a robotic arm to scoot under and turn it. The students initially made the machines as part of their coursework. Now they are volunteering their time, Ting said. He said the design was tricky, but Sawyer is optimistic. She hopes the book might tour the region or even the world if and when it is completed, as a testament to her students' dedication to peace. "This book is happening this year - I know it," said the teacher. "Somebody's got to have an empty airplane hangar. Someone's got to have the space to build this thing." Her dedication has already produced results. The Museum of Science in Boston has expressed an interest in the book, though curators said the UMass students' device would be an essential draw for any exhibit. The book and page-turning device would illustrate the museum's goal of mingling engineering and education, said Peter Johnson, the museum's vice president for exhibits and design. "We like the whole enterprise of students who had this big dream and decided to go forward with it," he said. Sawyer said she has lined up publishing firms, book designers, and others who are willing to donate their printing presses and expertise to create the book once a workable design is drafted. She is also looking for corporate sponsors who might donate money both for the project and for ancillary costs, such as transporting the book once it is made. But she is also on a deadline: The fifth-grade students who started with the club will be leaving for high school at the end of the school year, and her dream is for them to see the project come to fruition. That might be unlikely. But Sawyer hopes to create a quarter-scale prototype of the book to test if it works with the quarter-scale page-turning device the UMass students recently completed. Whether the giant book ever sits on a giant bookshelf, Sawyer has already accomplished the educational goal she set for herself years ago. Her students, who range from age 10 to 14, have developed sophisticated opinions on world peace. Asked to explain her comment, she said most wars in the developing world result from competition over land and resources. The youngsters' opinions were echoed by Cambridge resident Terry Greene, a member of September 11th Families for Peaceful Tomorrows, a New York-based group of relatives of people killed in the 2001 terrorist attacks. The group opposes US military actions following 9/11, and Greene wrote a letter for the book and recently visited the club at the school. "Right around the days of 9/11, it was very difficult watching TV and seeing the calls for a violent response," said Greene, whose brother, Donald Freeman Greene, died on United Airlines Flight 93 in Pennsylvania. "The last thing we want to do is become more like the people who have caused pain." The club has also stirred controversy. Last June, Sawyer said, she organized a peace rally at the school that raised eyebrows among parents who felt she might have been espousing unpatriotic values or criticism of the war in Iraq, news of which was on everyone's minds when she and the students first started the club. The students denied they were for or against the Iraq war. They said they were more interested in peace in general. "The Iraq war is as relevant as any war," said Ben, a 14-year-old from Dunstable. "This is a world peace thing, not just America." A 10-year-old from Groton named Sam, whose brother, an Army sergeant, was killed in Afghanistan last year, said losing a family member has made him more committed than ever to the club and its project. "My opinion is basically nothing, not very much good, can come out of war," he said. "It's pointless killing. You're shooting at people because people are shooting at you." John Dyer can be reached at johnjdyerjr@gmail.com.